Atomic Lighter® | Official Site | The Fuel-Free, Rechargeable Lighter That Works Anywhere, Anytime! Just Press The Button And Atomic Lighter® Will Light The First Time, Everytime! Withstands The Windiest Rainstorms And Still Stays Lit. Now That's Atomic Tough! Get Over 100 Uses With A Single Charge! No Gas Or Butane Required. Using matches can be a pain - they break and you get burned. Disposable lighters run out of fuel and never stay lit when you need it the most. Atomic Lighter® is the fuel-free rechargeable lighter that works anytime, anywhere. READ FULL DESCRIPTION The Atomic Lighter® uses Plasma Arc Tactical Technology that creates fire fast without gas or butane. Just press the button and it lights the first time, every time. It's rechargeable by USB. so it's always ready to go and you get over 100 lights on a single charge. Atomic Lighter® is the best lighter whether you're lighting birthday candles or cleaning the end of a rope. If you need fire, you need Atomic Lighter®! There's no flint, so even if it gets wet it still lights - it even works in the windiest of rainstorms. Atomic Lighter® is perfect for BBQs, bonfires, and backyard fireworks. It's a must have to include in your survival kit! Unlike rinky dinky ordinary lighters that blow out with a whisper, Atomic Lighter™ won't let you down! It's Atomic Tough and built to last. The Atomic Lighter™ could be yours for only $19.99 and pay NO SHIPPING AND HANDLING! But wait, if you order now, you can double your order and get TWO Atomic Lighters™! You'll also get our Atomic Beam USA™ Flashlight! Just pay a separate fee of $19.99. Your order will also be covered by our lifetime guarantee. Hurry and place your order now! 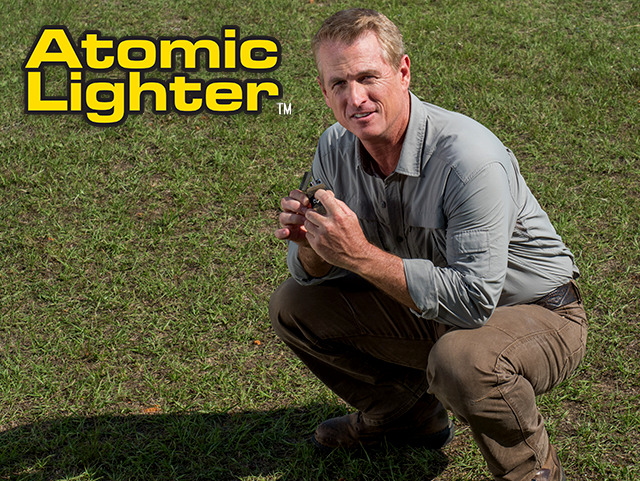 The Atomic Lighter® is the ultimate fire-Starting tool! Utilizes Plasma arc technology so it'll light the first time, everytime. From bonfires, barbeques, and backyard fireworks, Atomic Lighter® works the best! Atomic Lighter® is rechargeable by USB so it's always good to go. Order the Atomic Lighter® now! Check out these other great products by Atomic Lighter®. TEXT FOR OTHER PRODUCT OFFERS.